This is a community specifically for sharing rare/unreleased material by The Cure or Cure related bands. We can’t stress enough to NOT post studio albums! You can buy them at any record store and support the band! We will not be held responsible for copyright infringements. To share files, we recommend using one of the file hosting services such as Mega Upload, You Send It, Rapid Share, Save File, or your own personal server. Be forewarned that these websites delete your uploads after a week so it’s up to you if you wish to repost or keep them up. 1: DO NOT post studio albums or you will be banned immediately! 2: If you want to upload more than one song, please compress it with Winzip or Winrar. 3: If we see fighting, bickering, or just plain rudeness then you are out the door. 4: You may post music videos & live performances as well. 5: All posts are automatically set to FRIENDS ONLY. 6: If you plan never to share then don't join for we have no use for you. 7: Cure song covers & tribute pieces are allowed. We also would appreciate if you thank each person for posting after downloading their shared goods. It’s rude and just ungrateful to not simply say thank you for taking the time to do this for us. Since we doubt this community will get as big as other music sharing communites, we have decided that posting any requests is fine. You don't have to email them to the mods, you can just post right here if you are looking for something. As much as we all love the cure, this is not the place to post pictures of you with robert, you dressing up like robert, etc. please don't post links to ebay auctions or to your cure fan art. we don't care about your personal cure stories (we have good ones too) and we don't want to know about your front row seats to wherever or what other bands you like. and we do NOT want to have the argument about whether or not the cure is goth. save all that crap for other cure communities because if it gets posted here it will be deleted. 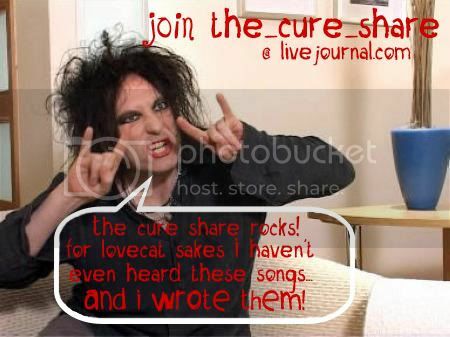 the_cure_share is about the music. Any questions or concerns? Please contact your friendly maintainers, trioxin_grave, the__figurehead or recycled_air. 2 Imaginary Boys | Do The Hansa!